Since the Office of Sustainability opened in January 2015, UMass Lowell has received approximately 15 awards or recognitions relating to its commitment to sustainability. Just last year, the Association for the Advancement of Sustainability in Higher Education (AASHE) recognized UMass Lowell as a Gold Institution as a part of their Sustainability Tracking, Assessment & Rating System (STARS). The STARS rating system is a comprehensive self-report tracking system that measures the sustainability efforts in over 700 higher education institutions internationally. Institutions receive ratings of either Bronze, Silver, Gold or Platinum which cover a variety of areas including academics, engagement, planning, operations, innovation and more. Only two institutions in the world have earned the Platinum rating. Of course, great scores in STARS is followed by many other recognitions related to sustainability. This year, UMass Lowell received the Pinnacle award for the Massachusetts Excellence in Commuter Options (ECO) for the fifth year in a row, the highest possible award in its category. The Massachusetts ECO Awards celebrate employers and universities that encourage and support sustainable and affordable transportation options such as biking. The American League of American Bicyclists recognizes UMass Lowell as one of the five universities in the state that is bike friendly. The Office of Sustainability works with the UMass Lowell Police Department, the Office of Residence Life, the Campus Recreation Center (CRC) and Transportation Services to ensure that students, faculty and staff have convenient and sustainable methods of getting around the community. One sustainable transportation program UMass Lowell offers is the FreeWheelers Bike program. FreeWheelers allows students to use free bikes from five convenient locations around campus after registering online once. Another great way for River Hawks to get around Lowell is the recent collaboration with the Merrimack Valley Regional Transit Authority (MVRTA) and Lowell Regional Transit Authority (LRTA) so that anyone with a university ID can use the services for free. Also this year, students worked in Toxics Use Reduction (TURI) laboratory to test and reevaluate the bike cleaners used in the campus bike shop on East Campus. As a result, the bike shop switched bike cleaners to safer, more environmentally friendly products using their findings from the lab. UMass Lowell takes pride in positive collaborations that have positive results. For example, the efforts to connect UMass Lowell with the Lowell community to ensure healthy urban forests. For the seventh year in a row, the university has been recognized by the National Arbor Day Foundation as a Tree Campus USA member. The conservation and education foundation is the largest nonprofit membership organization devoted to tree planting. 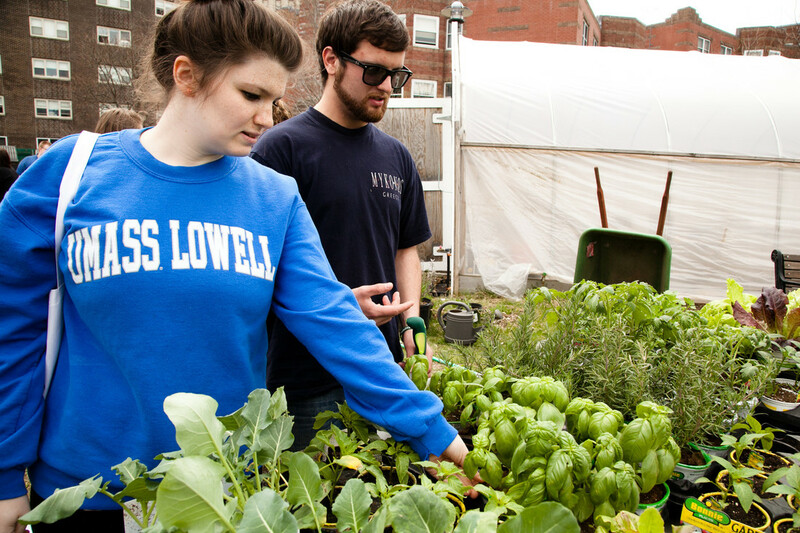 There are various new programs at UMass Lowell thanks to the Office of Sustainability. This is the first year with the $10 waivable sustainability fee that helps fund student-focused projects directly on campus. A portion of the fee also goes into the Sustainability Engagement & Enrichment Development (SEED) Fund. Last year, the SEED Fund awarded $50,000 to sustainability projects around campus. Another new program this year is the Leaders in Environmental Advocacy for the Future (LEAF) Learning Living Community (LLC). LLCs group students together that share interests in the residential halls, connect students to opportunities within these interests and hold related events. LEAF is a sustainability and environmental focused LLC. LEAF will be hosting public events throughout the school year. UMass Lowell’s sustainability efforts, which began in 1989 with a recycling program, continue to advance with a climate neutrality target date of 2050.